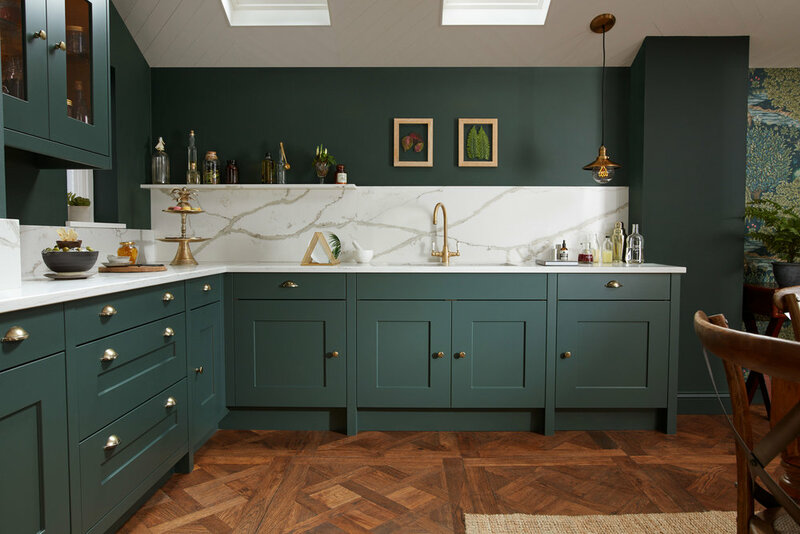 We may be experiencing the hottest summer for decades which is bringing us all the bright sunshine but one of the biggest trends this year is the dark and sophisticated kitchen. Think emerald green hues, midnight blues and matte black mixed with shiny metallics such as gold and copper for a sharp, bold interior look. Be brave and design your whole kitchen in a dark hue or dip into the trend with an island or dresser in a dark colour with a lighter door elsewhere to compliment and lift the space, particularly if you have a smaller space to work with. Another way to incorporate this trend into your space without the full commitment of a new kitchen is adding darker accessories such as tea towels, wall art or paint your walls in a deep and rich shade such as Hicks' Blue by Little Greene Paint Company for a slight nod to the trend. Below we have picked a few of our favourite kitchens that encompass this trend and can all be designed around your space from our showroom in Attenborough Village. What would you design? Newer PostTiles Vs Wall Panels?